A scene from Walking Wounded: Uncut Stories from Iraq, a graphic novel adapted from a documentary by Olivier Morel, an assistant professor in the Department of Film, Television, and Theatre. A mother’s face etched with grief, her son’s dog tags dangling from her hand. A father in a rocking chair, cradling his grown son for the last time. These parents—and other families of returning Iraq War veterans—are the subjects of Walking Wounded: Uncut Stories from Iraq, a graphic novel by Olivier Morel, an assistant professor in Notre Dame’s Department of Film, Television, and Theatre. Based on Morel’s award-winning documentary On the Bridge, the book not only portrayed stories of veterans suffering from severe PTSD and often contemplating suicide, but it also offered a behind-the-scenes glimpse of Morel’s emotions and struggles as he interviewed veterans for the film. Walking Wounded, illustrated by the artist Maël, also inspired Morel to create an undergraduate course—Graphic Wounds, Graphic Novels—that he taught last fall. Through in-depth readings and discussions with some of the genre’s leading authors, the class explored how trauma and recovery are depicted in nonfiction graphic novels. The goal of the class was to analyze how literacy, print technology, the film industry, and developments in narrative art combine to transform the tradition of graphic novels. 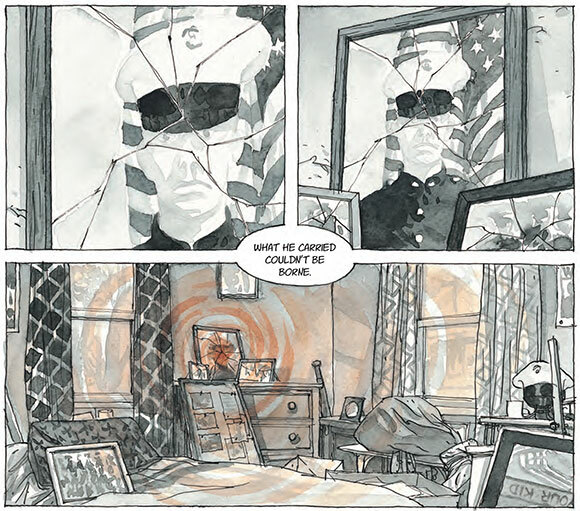 Olivier Morel, as depicted in the graphic novel Walking Wounded. This innovative genre, Morel said, is located at the intersections of several disciplines—journalism, autobiographical fiction, photography, and documentary film. 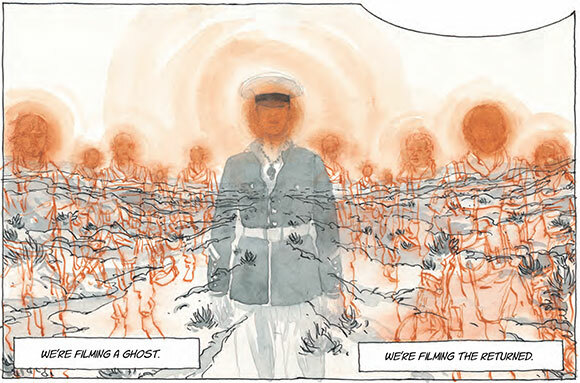 Using a wide variety of illustrative styles, the graphic novels in his course addressed subjects such as terrorism, war, and PTSD, often from a first-person perspective. The growing influence of these “creative documentary graphic novels” can be attributed to the art form’s anti-conformist history—it’s “a genre that is not always well-behaved,” Morel said—as well as its tendency toward social realism and its deeply personal nature. “What you read is viewed through the eyes of one artist, who has his own way of seeing and depicting reality,” he said. “In this sense, graphic novels are somewhere between journalism, in the traditional sense, and essayism, with a very personal approach to things. This makes the graphic novel a powerful tool for depicting real events—offering an unflinching portrayal of a difficult situation without making the images graphically unbearable, as they might be if presented as photos or videos in the news. In Morel’s class, students read a variety of post-9/11 graphic novels, including Art Spiegelman’s In the Shadow of No Towers and Joe Sacco’s Palestine and Days of Destruction. Each week, they had conversations with authors and illustrators via Skype to discuss the novels and the process of creating such personal works. At the end of the course, students were offered a choice between writing a scholarly paper and proposing a subject for their own investigative documentary graphic novel—including writing a treatment, presenting sources, proposing a script, and even drawing a scene. Every student chose the creative option. “The results were just mind-blowing,” Morel said. “I had several students who not only came out with highly engaging and deep subjects, but also compelling drawings, photographs, and more. I know that we planted the seeds for future careers and that some of them got really interested in this highly versatile genre that could evolve toward documentary filmmaking, animation, fiction filmmaking, and journalism. Auschwitz survivor Eva Kor, in a scene from Tikkun Olam: To Heal the World, the senior thesis documentary by FTT major Dylan Parent. In fact, the course has already helped bring one such project to life. FTT major Dylan Parent ’15 was drawn to the class because of Morel’s experience in trauma and recovery. 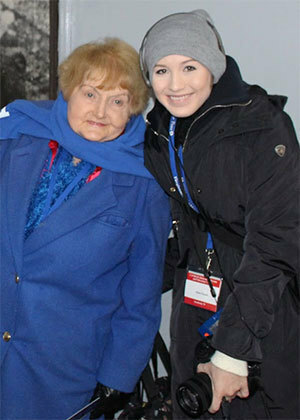 With his guidance, she developed her idea for a senior thesis film on Auschwitz survivor Eva Kor, who publicly forgave Josef Mengele and the Nazi Party for the atrocities she, her twin sister Miriam, and their family endured during the Holocaust. 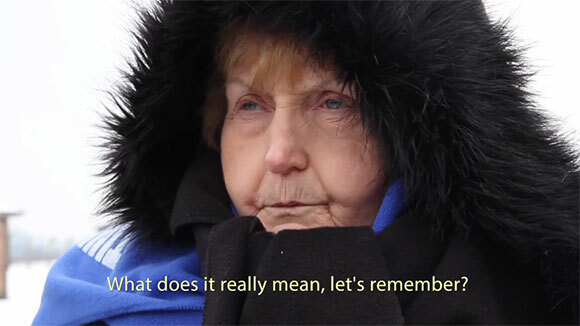 In winter 2015, Parent filmed Kor and a small group who accompanied the 81-year-old survivor as she made her annual educational trip to Auschwitz to honor victims and advocate for forgiveness. To help fund the journey, Parent received Notre Dame’s Broad Avenue Filmmakers Award—a grant awarded annually to two outstanding film projects, one fiction and one nonfiction, by FTT seniors. The 13-minute documentary, Tikkun Olam: To Heal the World, has been selected to screen at the 2015 St. Louis International Film Festival where it will open for the feature film A Nazi Legacy: What Our Fathers Did, directed by David Evans (Downton Abbey, Fever Pitch). Taking on the project was challenging—both in its scope and subject matter—Parent said, but working with Morel, who served as her senior thesis adviser along with Associate Professional Specialist Ted Mandell, made the process easier. “Olivier was just a fantastic mentor to talk to about some of the emotions I was experiencing as I went through the process of going to Auschwitz and putting together a film,” Parent said, “because they are similar emotions to those he experienced when he made his film On the Bridge. Parent, who is now completing an apprenticeship in stage management in Naples, Florida, said the course also caused her to re-examine her views on graphic novels. “I definitely came in with a lot of bias toward the medium itself—as comic books or as frivolous—and I had to remind myself to have an open mind,” she said. “And I really did restructure my feelings on the graphic novel. I now think that it’s a beautiful art form that has so many possibilities for expression and exploration. In conjunction with the course, Morel also created an innovative conference, “WWI in the Graphic Novels: A Drawing Cabaret,” which featured European artists and writers talking about their works and creating illustrations live in front of an audience. Morel, who is also an assistant professor in the Department of Romance Languages and Literatures, worked extensively to document and preserve the memories of soldiers who served in World War I. He spent seven years traveling the world to find and interview the last surviving veterans of the conflict—who were between 99 and 110 years old at the time—in the United Kingdom, Russia, Senegal, and elsewhere. His research was published in the book Visages de la grande guerre, used in three documentary films, and featured in several exhibits, including an installation in the Gare de l’est in Paris in 2014. Parent had the opportunity to participate in the conference by reading aloud a portion of a graphic novel while the artist created a watercolor painting of it on stage. 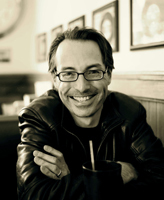 Morel credits Jim Collins, professor and chair of the Department of Film, Television, and Theatre, with encouraging him to design the course, and said that it was one of his greatest experiences as a teacher. Originally published by Carrie Gates at al.nd.edu on October 06, 2015.